We live in times where we can safely say that virtual reality is finally better than reality. It gives a gamer a sweet escape to a place where he or she is finally in control. Gaming has come a long way in the last few decades; the impressive leaps and bounds in technology and graphics have contributed tremendously towards this. 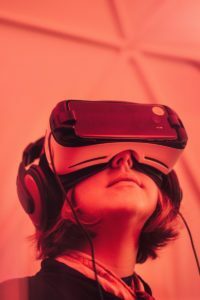 For anyone getting started, virtual reality uses three-dimensional stimuli, where the user can experience elements within the virtual environment when interacting with it. Virtual reality (VR) gaming use ‘bio-sensing’ or in laymen terms sensors which detect a person’s movement that is transmitted via the hardware into altering the environment of the game.It’s not just teenagers who are addicted to the high-adrenaline fused games backed by powerful animation, it’s adults as well. What do you need for VR gaming? To enter VR gaming, there are four components you would need to have in check. To top the list, you would need a headset (that resembles more like snorkeling goggles). The more complex these are, they would unlock certain apps and optimize its usage. You would also need a pair of high-quality headphones to complement the latter. Apart from this, there are optional items that can enhance your gaming experience, such as, hand controllers that will transmit your gestures during the interaction. Like apps on smartphones, the virtual reality devices, too, have similar app stores; you can browse through to download apps and games. Next, you would want to upgrade your mouse and keyboard to suit the other hardware components; if not, gamers can switch to a gamepad which is easier to operate that the keyboard. Specialist controls and motion controls also enhance the VR gaming experience. Gamers can engage their efforts in ‘Elite: Dangerous’, a multiplatform VR game which still thrives despite being in its thirtieth year. The game caters to contemporary times and has an ethereal representation of our future galaxy. ‘Keep Talk and Nobody Explodes’ requires careful attention of 2 to 6 players, one gamer will have the ultimate task of diffusing a bomb and other gamers should provide instructions. This game is recommended for a group of peers who are aware of each other’s traits that will be useful during the game. Jobs with a sardonic twist can be found in ‘Job Simulator’; it’s the year 2050 and regular jobs have been replaced. The VR game would allow the gamer to experience these jobs conducted by robots who don’t know how to perform them and are placed in museums. ‘Resident Evil 7: Biohazard’ is considered a breath of fresh air – pun not intended. The VR game is played using a first-person perspective, and it’s taken back to its roots of horror. Your main task in this game is to find the missing wife of Ethan Winters, in an abandoned house. Which reality would you like to live in?